Standing at Mannings, take a right towards the port and you'll find yourself on the Ronseally named Beach Station Road (never mind that the actual beach station was bulldozered a year or two back). Among the motley outlets are Jack's on the even numbers and Cafe 7 on the odds. Unbeknownst to any of us, even local lord-of-the-manor Kev, there sits an eatery that's not even on The List. Brakes on and brace yourself. Sometimes, say as with Artizan, it's hard to know what to expect. Very much the opposite at this establishment. 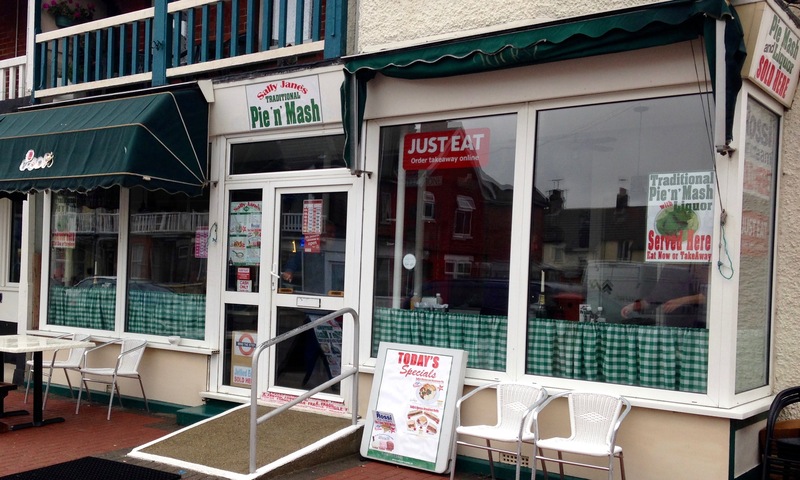 Signs aplenty advertise "traditional pie 'n' mash with liquor served here". Welcome to Sally Jane's Pie 'n' Mash and not, as I thought, that lady from Tiswas. Where to start? The old-fashioned red phone box that sits as a portal between behind the counter and the shop? Chas 'n' Dave on the tannoy? When in Rome, much as we should have done on our trip to the Mexican Momentum, try the local grub. Not quite being brave enough to try either the stewed or jellied eels, that'll be pie 'n' mash with liquor, please, Sally. Top value at £4, by the way. CnD are rabbiting away as our mates' plates descend. There's my chicken & mushroom pie and my two mounds of mash swimming in a pool of parsley sauce, i.e. the liquor. Solid nourishment, that, and we're far from the only ones scoffing mains. Niche business, perhaps, and probably for everyone, but super Sally knows her stuff. Her website has all the pie info you'll ever need. Go check it out. Meanwhile, we're all off for a brisk walk along the tiddly prom. If it was a car -- Vauxhall Cresta. If they were passing by -- Nik Hodges.